Happy Halloween! This costume, "Spaghetti & Meatballs" was suggested as a child's costume in Family Fun Magazine, but it's great for adults too. 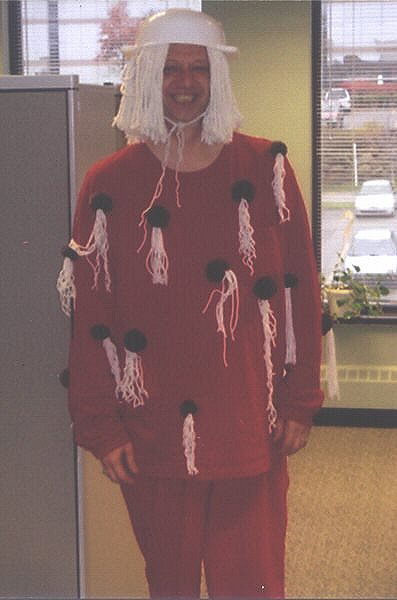 The plan is simple: red jogging outfit with brown pom-poms and white yarn for the pasta, sewn on. On my head is a cheapie plastic colander with a mop head underneath. It's cheap & easy! I won 1st prize at work and then sold the outfit on Ebay for around $30... and the buyer said she won 1st prize in her costume contest.